We are now bullish on the prospects of Zee Entertainment Ltd as now stock is showing signs of recovery post its dip. Stock has rebounded from its 200 day moving average and till the time the level of 265 is not broken on the downside we can be bullish on the stock for the target of 280, 293. Rather stock has broken the rectangle formation by moving above 265 level and now in few trading sessions can target 293 level which happens to be its resistance. 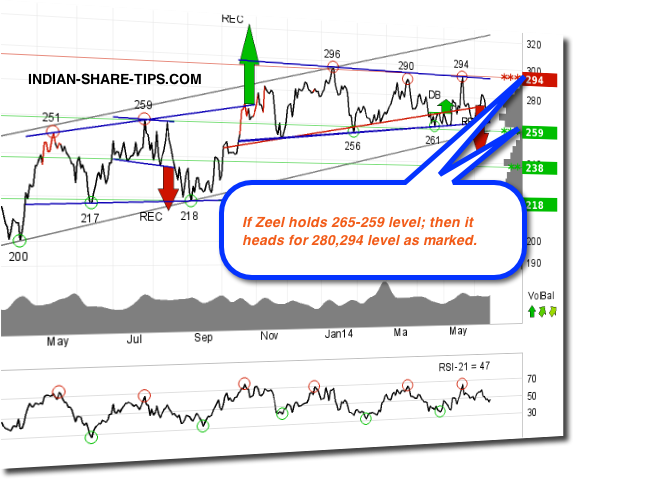 As a strategy one can be short in the stock if it breaks the level of 265 and once this level is broken than it finds support at 259 level. Supports are the levels from where stock generally rebounds. As a disclaimer; Our clients have been long in the stock wef 18 June 14 and you can equally get benefitted with our delivery stock tips and make money like professionals with our daily one intraday tip and let profit multiply in your bank.